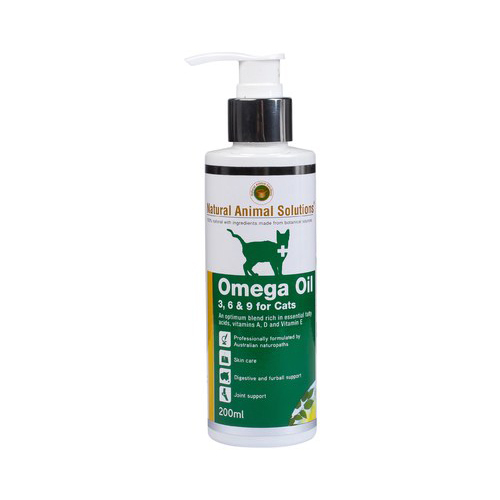 Natural Animal Solutions Omega 3, 6 & 9 Oils is an essential solution for cats. Blended with rich ingredients as well as vital vitamins, these rich supplements supports digestion, healthy joints as well as takes care of the cat’s skin and coat. In short, this product is useful for the overall well-being in cats. They are high in EPA/DHA and have been thoroughly studied to ensure that your cat receives the apt ratio of Omega 3, 6 & 9. Natural Animal Solutions Omega 3, 6 & 9 oil is rich in essential fatty acids and vitamins as well. These ingredients are uniquely blended to nutritionally improve the overall health of cats and enhance skin and coat sheen in the process. For cats, Natural Animal Solutions come in 200ml packs. To maintain optimal health, don’t overdose cat. For cats 3ml per day for upto 3 weeks. Dosage can be reverted back to normal dosage as well. Close container tightly after use.